Previously, Alane passionately taught Deaf children for 20+ years in Boston, MA, and was also a Licensed Massage Therapist for the past 5 years. A long-term pet sit originally brought her to the mountains of Idaho, May (near Challis), and then to Boise. Alane has gratefully completed sits in many places, such as Massachusetts, New Mexico, Hawaii, Vieques Island in Puerto Rico, Mexico, and Costa Rica, to name a few. She even had a boat-sit in St. Petersburg, FL for 6 months. Alane enjoys new experiences and spending time in new locations to get to know the community and to have time to care for animals. Alane has always had an animal in her life, as her own pet or by taking care of others, for her friends and family. Spending quality time with the pets, giving them love and attention is a priority for her. Alane brings to the team a passion to be with animals and a compassion for animals of all kinds. She has a great work ethic and great attention to detail. 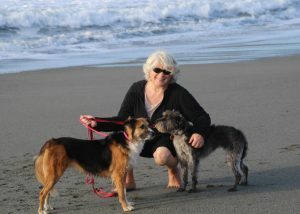 Alane’s other passions include photography, reading, swimming, spending time at the ocean, hiking, and writing – about her experiences with the pets she has come to love as her own, and about her travels.